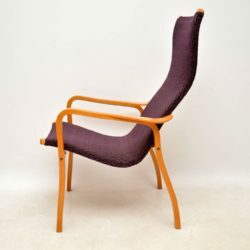 A stylish and extremely comfortable vintage armchair, made in Sweden by Swedese, this was designed by Yngve Ekstrom. 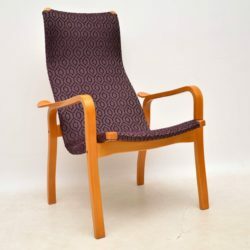 The condition is superb for its age, the frame has just been fully stripped and re-polished to a very high standard, and it was recently re-upholstered by the previous owner in a beautiful purple fabric. The original canvass straps are still beneath the upholstery, they are all strong and intact. I think it was recovered as the straps were slightly marked and worn. 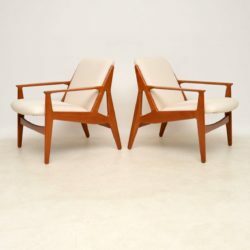 A beautiful and stylish pair of teak vintage armchairs, these were designed by Egon Eiermann, they were made in Germany in the 1960’s. 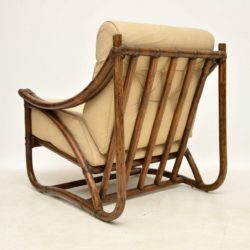 They have a stunning design, we have had the frames completely stripped and re-polished to a very high standard, and the seats have been re-upholstered in a gorgeous light green fabric; the condition is superb throughout. 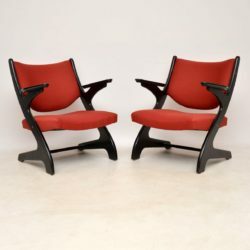 A beautiful and iconic pair of armchairs, these were designed by Josef Hoffman in 1910. 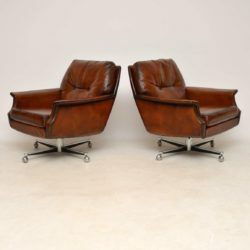 This pair in brown leather date from the late 20th century, they are in great condition with only some extremely minor wear here and there, mostly around the top of one arm and seen in the images. 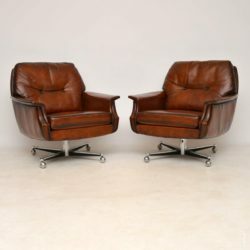 They are extremely well made and comfortable to sit in, the brown leather has a beautiful colour and patina. 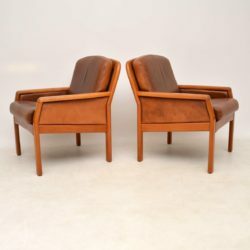 A very stylish and extremely comfortable pair of vintage Italian armchairs, these date from around the 1960-70's. 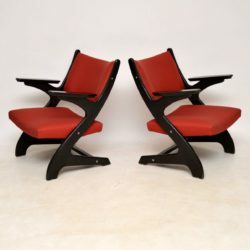 They have a stunning shape, with ebonised wood frames, the condition is very good for their age. The frames are all clean, sturdy and sound, with only some extremely minor surface wear. The original red fabric is a little faded with one or two extremely faint marks, overall the fabric is clean and in good condition for its age. 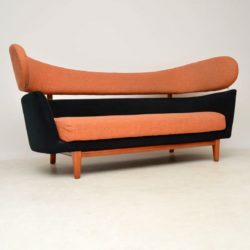 A lovely vintage modular unit in leather by De Sede, made in Switzerland and dating from the 1960-70’s. 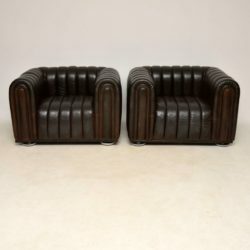 This would originally have been part of a large modular sofa; we obtained this piece as a single which is quite unusual, and also unusual is the original leather matching cushion that came with it. 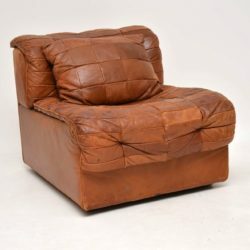 The brown patchwork leather is nicely distressed with various signs of surface wear and a nice patina; there is one tiny repair to the leather on the seat. This is very comfortable, as well as being very compact and practical. 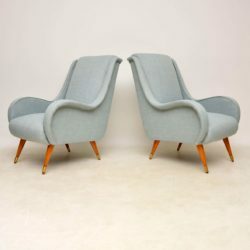 A stunning and very comfortable pair of vintage Italian armchairs, these date from the 1950-60’s. 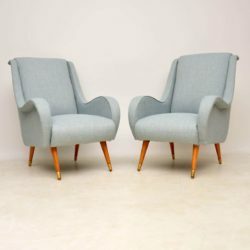 We have had them completely re-upholstered in our lovely light blue fabric, we have also had the brass capped legs fully stripped and re-polished to a very high standard; the condition is superb throughout. 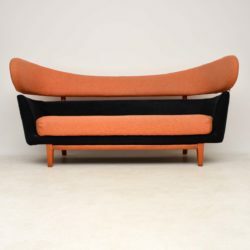 This is a very high quality retro style sofa, inspired by the classic Finn Juhl design for Baker furniture in the 1950’s. 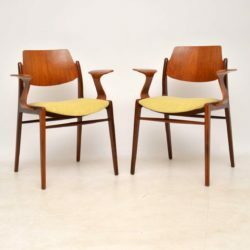 This example dates from the late 20th century, it’s very well made and is in very good condition. There is just some light surface wear to the fabric, there are no stains or marks to be seen. 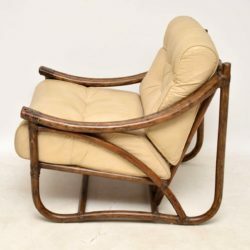 The solid teak frame is also in great condition, very clean and sturdy, with just some very minor surface wear to the upper edges. 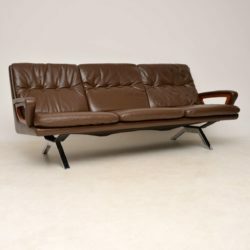 A stunning vintage Danish leather sofa of extremely high quality, this dates from around the 1960-70’s. 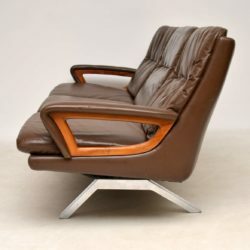 It has a beautiful design, with gorgeous brown leather upholstery, solid teak arms and a stylish chrome base. 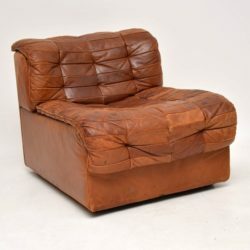 This is very comfortable and in great condition for its age. 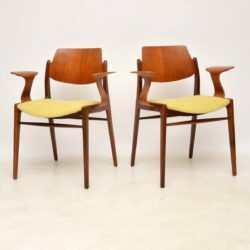 The brown leather has very little wear, there is just a tiny repair to the leather on the back near the bottom, hardly noticeable at all. 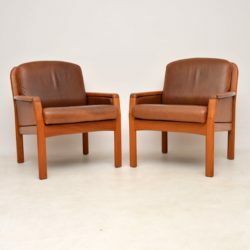 A stylish, top quality and very comfortable pair of vintage Danish armchairs, these were made by Dyrlund, they date from the 1960-70’s. 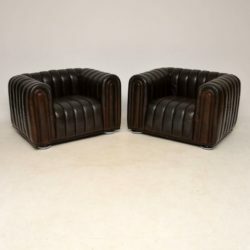 They are in very good condition for their age, the brown leather has a lovely patina, with some light surface wear here and there. 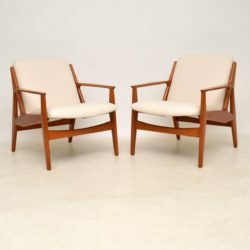 The solid teak frames are very sturdy and clean, with also just some minor surface wear and a few minor marks here and there.